Is Apple engaging in innovation by intimidation? 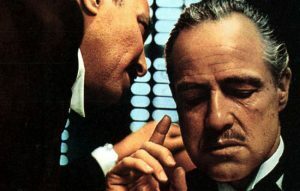 "So the next day, my father went to see him; only this time with Luca Brasi -- and within an hour, he signed a release, for a certified check for $1,000...Luca Brasi held a gun to his head and my father assured him that either his brains, or his signature, would be on the contract". -- Michael Corelone, "The Godfather" movie. There has been much debate about whether the recent rash of patent lawsuits will stifle innovation. Debate no more. In its patent claims against HTC, Apple is targeting Android creator Andy Rubin for work done for the Mac maker -- get this -- in the early 1990s. The message is clear: If you ever worked for Apple, we'll sue your new employer, too, simply because you were here when X, Y or Z patented software process or technology was developed. Consider HP. What if the computing giant viewed TouchPad as more trouble than it's worth, from an Apple patent lawsuit perspective, versus potential profits and marketing position. HP's decision to kill off TouchPad after only six weeks of sales is perplexing -- but perhaps more sensible in light of recent patent litigation. Jon Rubinstein helped Apple invent the iPod before going to Palm and later becoming CEO (June 2009). Palm hired Rubinstein to sprinkle some of that Apple-like magic into its products, and he did; webOS is easily the most fluid and synchronization-capable mobile operating system available today. Surely Rubinstein's work for Apple creates all kinds of potential patent problems for HP, whether webOS or TouchPad. The legitimacy of any patent claims is immaterial to Apple's willingness to sue and entangle any competitor in costly and distracting litigation. Then there's Amazon. Rubinstein joined Amazon's board of directors in December 2010, and the company is working on an Android tablet that many analysts are already calling iPad killer sight unseen. Why? Because Amazon proved its mettle jump-starting the long-languishing ebook market. Kindle and Kindle Store are huge successes -- the e-reader is category leader, based on shipments, according to IDC. Amazon also is expected to price its Android tablet well below iPad 2. Then there is its depth of retail experience, supporting digital stores (games, music and movies), Android app store and the likelihood Amazon retail shops will be a core part of the modified Android to consider. Yeah, an Amazon tablet could be heap loads of iPad competition. If you listen really, really carefully, you can hear Apple lawyers clamoring in the distance discussing the lawsuit. What will Apple allege Rubinstein learned about patented processes or technology while working there? Rubin is the model for personal attacks against Rubinstein and other traitors -- eh, former Apple employees. "A data transmission system having a real-time data engine for processing isochronous streams of data includes an interface device that provides a physical and logical connection of a computer to any one or more of a variety of different types of data networks. Data received at this device is presented to a serial driver, which disassembles different streams of data for presentation to appropriate data managers. A device handler associated with the interface device sets up data flow paths, and also presents data and commands from the data managers to a real-time data processing engine. Flexibility to handle any type of data, such as voice, facsimile, video and the like, that is transmitted over any type of communication network with any type of real-time engine is made possible by abstracting the functions of each of the elements of the system from one another. This abstraction is provided through suitable interfaces that isolate the transmission medium, the data manager and the real-time engine from one another". * The description is overly broad and surely is overlapped by other patents held by other companies. * Apple filed the patent in August 1994, which shows just how far back the company is willing to claim infringement related to former employees. The US Patent and Trademark Office granted the patent in January 2002. James Nichols and John Lynch are listed as inventors. According to a recent Apple filing in the HTC lawsuit: "Mr. Rubin began his career at Apple in the early 1990s and worked as a low-level engineer specifically reporting to the inventors of the '263 patent at the exact time their invention was being conceived and developed...It is thus no wonder that the infringing Android platform used the claimed subsystem approach of the '263 patent that allows for flexibility of design and enables the platform to be 'highly customizable and expandable' as HTC touts". Mueller explains: "It's possible that [Rubin] then contributed to the implementation of the claimed invention". Much depends on whether Apple can convince the International Trade Commission or another legal entity that Rubin "willfully infringed" on a software process his former bosses worked on when he was a "low-level engineer" in the early 1990s. Mueller writes: "If the ITC upholds the initial determination that the '263 patent is valid and infringed by Android, Google should be very concerned. An ITC decision doesn't bind the federal courts, but the likelihood of Apple being able to enforce this patent -- and thereby have Andy Rubin declared a willful infringer of a patent developed at Apple while he worked there, by the very people he worked for -- would certainly be much greater than if the ITC decided differently". I ask then: What claims could Apple make against former high-level employees like Rubinstein or "low-level" employees who left and succeeded elsewhere? Apple has failed to compete successfully against Android, so the company has engaged a patent war -- innovation by intimidation. Android smartphone subscriber market share was 41.7 percent at the end of July, up 5.4 point in three months, according to comScore -- that's for the United States. By comparison, iPhone/iOS grew by 1 point to 27-percent share. Globally, Android smartphone share was 48 percent in second quarter, according to Canalys. At Apple, it has long been operating practice: our way or the highway (Just ask company partners and customers). Now Apple will run you down if you do. Or in going another way you challenge Apple to drag race (compete with it). Apple thugs (its lawyers) and cops (the courts) will take you to jail (block your product from shipping) for even thinking about dragging Apple. The company then wins by default and keeps its title of drag-race king. Does all this legal activity stifle innovation? That's a question for mobile and cloud startups or companies that employ former Apple employees to answer.